An RSS feed (or news feed) is a means by which you can stay informed about what's going on at VocalFX without having to regularly visit the website. 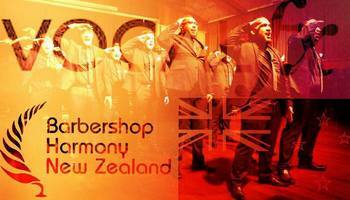 Vocal FX is a young men's barbershop a capella group, based in Wellington, New Zealand. Vocal FX's style ranges from barbershop to upbeat early pop and funk. The chorus is the reigning New Zealand national champions as well as the Pan-Pacific champions. In 2018, Vocal FX placed 9th in the world at the Barbershop Harmony Society's international competition in Orlando, Florida. We would love you for to come and listen to us perform, so keep an eye out on the Facebook page or this page for upcoming events!!! Rehearsal are from 7:00pm to 9:00pm on Monday evenings at Tawa College, see enclosed for details! Want VocalFX to sing at your next function? Why not hire VocalFX to entertain at your next event? We can perform at corporate functions, charity events, community Entertainment events, birthday parties, christmas parties, awards nights, weddings, engagements, anniversaries, engagements, and even funerals and memorial services.